Most people know Botox® can reduce wrinkles. However, Botox® has applications beyond cosmetic enhancements. For example, it can reduce excessive sweating. Another application is relieving the pain associated with bruxism (the medical term for grinding teeth) and disorders related to the temporomandibular joint (TMJ). TMD, also known as Temporomandibular Disorder, is the technical term for TMJ Syndrome. The TMJ is a sliding joint connecting the jawbone and skull. Everyone has two TMJ joints in front of the ears on each side of the head. The joints allow the jaw to move up, down, left, and right. Patients who grind their teeth or have bite/jaw alignment problems often suffer from TMJ syndrome—a pain disorder localized in and around the jaw. 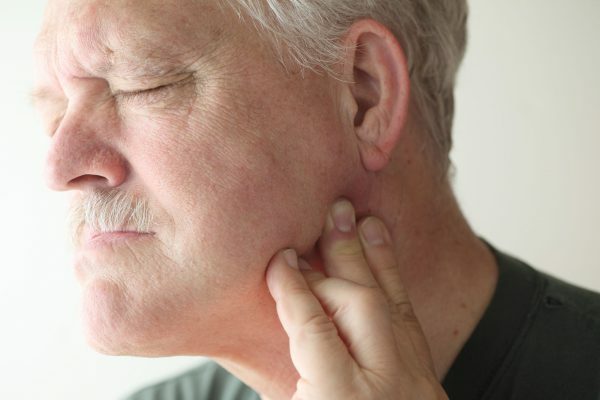 Find out if your dentist can diagnose and treat TMJ syndrome. 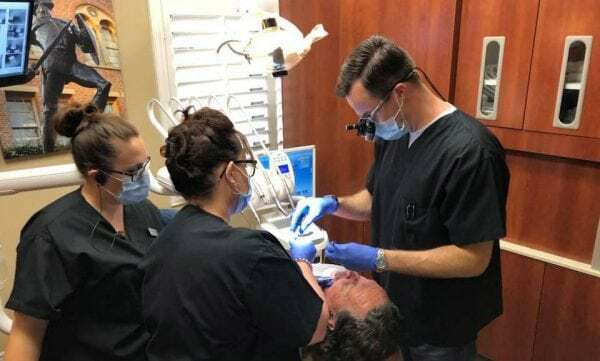 Luckily for Inland Empire residents, Dr. Derek Hauser and Dr. Matt Kanter of Lakefront Family Dentistry in Lake Elsinore can help stop jaw pain for patients who grind their teeth or have TMJ syndrome. Their treatment options include Botox® therapy. Have you ever woken up with a sore jaw and a dull headache? If so, this may be a sign of sleep bruxism. People who grind their teeth may also do it while they are awake, without being aware of it. Causes include stress and anxiety, but an abnormal bite or missing, crooked, or misaligned teeth are often to blame. Some people even suffer migraines from teeth grinding. Grinding teeth is closely related to TMJ syndrome. Dental x-rays and an examination of the teeth also help with the diagnosis. If left untreated, TMJ syndrome and chronic bruxism will result in fractured or loose teeth. In severe cases, teeth may fall out or suffer damage that requires bridges, crowns, root canals, implants, or dentures. However, a variety of treatments can help. the treatment option best suited to a patient’s unique needs—whether it be a custom teeth grinding night guard or Botox® therapy. If the first treatment option doesn’t work, Dr. Hauser and Dr. Kanter will recommend another treatment until they find a treatment that works best for the patient. One of the newest treatments offered is Botox® therapy. As mentioned earlier, Botox® does more than reduce the appearance of wrinkles. Injecting Botox® into the masseter muscles (the muscles responsible for grinding) relaxes the muscles and reduces or eliminates TMJ pain without affecting eating, chewing, or talking. The injections can be done in minutes and become effective within 3 to 5 days. Relief can last for as long as 3 months, and 2 to 3 treatments may be needed. Some patients find that their TMJ pain has vanished by the end of the treatment. During this time, patients can seek counseling to reduce stress and lose the habits that contribute to repetitive grinding or jaw clenching. Many people with chronic bruxism have enlarged jawlines. An additional benefit of Botox® therapy is a slimmed down jawline, resulting in a more attractive and balanced facial appearance. Botox® is an FDA-approved, purified protein produced by the Clostridium botulinum bacterium. Although it is safe to use, possible risks and side effects exist, as with all medications and treatments. Dr. Hauser and Dr. Kanter will review and explain the risk factors before treatment to ensure that patients are informed and comfortable with the treatment option. Mouth or Night Guards. Hauser and Dr. Kanter create custom grinding teeth guards to be used at night. Investing in a custom night guard is important, since store bought ones often don’t fit well, which can lead to more problems. Using a night guard helps stop teeth grinding and prevents further damage and deterioration to the teeth. This treatment starts with over-the-counter pain relievers and anti-inflammatories. If these don’t work, the dosage can be increased to prescription-strength ibuprofen. Another option is tricyclic antidepressants, which help relieve pain and control bruxism when used in low doses. A third option is muscle relaxants. Seeing a therapist or counselor can help patients reduce stress, anxiety and understand/control the behaviors that lead to grinding teeth. These behaviors include teeth clenching, leaning on the chin, and biting fingernails or non-food items (such as pens and pencils). TMJ Therapy. Exercises to stretch and strengthen jaw muscles can help with TMJ pain and grinding of the teeth. Ultrasound treatments and using moist heat and ice also help reduce pain. This minimally invasive procedure involves inserting small needles into the TMJ so fluid can be flushed out to remove debris and anything causing inflammation. TMJ Surgery. In some cases, the jaw may be misaligned to such an extent that surgery may be required. Surgical options include TMJ arthroscopic surgery, modified condylotomy, or open joint surgery. Surgical options should be a last resort. Dr. Hauser and Dr. Kanter will refer patients to a qualified surgeon. How Do I Stop My Jaw Pain from TMJ and Teeth Grinding? Avoid overusing jaw muscles by eating soft foods, cutting food into small bites, and avoiding sticky and chewy foods. Avoid chewing on anything that isn’t food—such as fingernails. Apply warm, moist heat or ice to the side of the face. If you’re clenching or grinding your teeth during the day, put the tip of your tongue between your teeth. This will help relax the muscle and prevent you from clenching and grinding. Learn a few exercises to relax the jaw and practice them regularly. One exercise involves massaging jaw muscles with your fingertips in small circular motions. You then open your mouth as wide as possible and hold it open for 10 seconds. Then relax the jaw. Repeat 10 times. Patients needing relief from TMJ pain should contact Lakefront Family Dentistry today so they can get relief as soon as possible. With 30-plus years of combined experience, Dr. Derek Hauser and Dr. Matt Kanter are two of the best Lake Elsinore dentists in the Inland Empire and are ready to help. 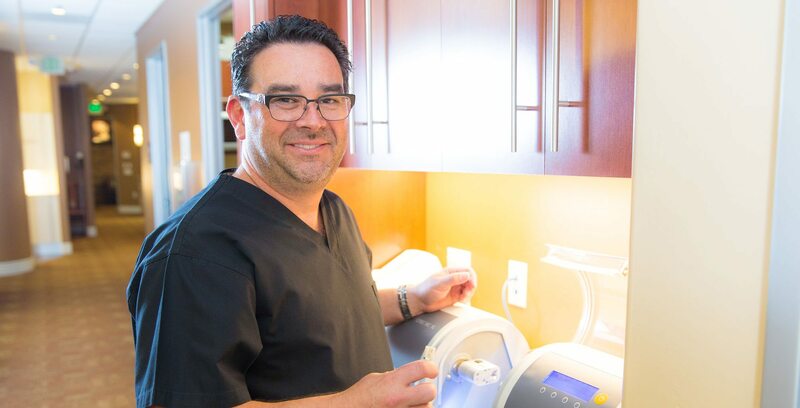 Please call (951) 244-9495 and schedule an appointment (or make an appointment online) to learn how you can achieve an amazing and pain-free smile.